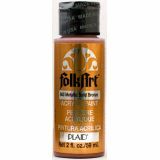 Folk Art Metallic Acrylic Paint - FOLK ART-2 ounces of Acrylic Paint. Shimmering Metallics are high quality waterbase acrylics which feature a velvety smooth, heavy pigmentation formula for superior smooth coverage. The colors created are not brash and glittering, they are more iridescent and glimmering.